Wrestling on The Simpsons isn’t something new. From Professor Werner von Brawn showing up as early as season two, to Bret Hart famously voicing himself in an unnatural way in an animated cameo. Up until then, The Simpsons had a pretty good track record of poking fun at grown men grappling in spandex. 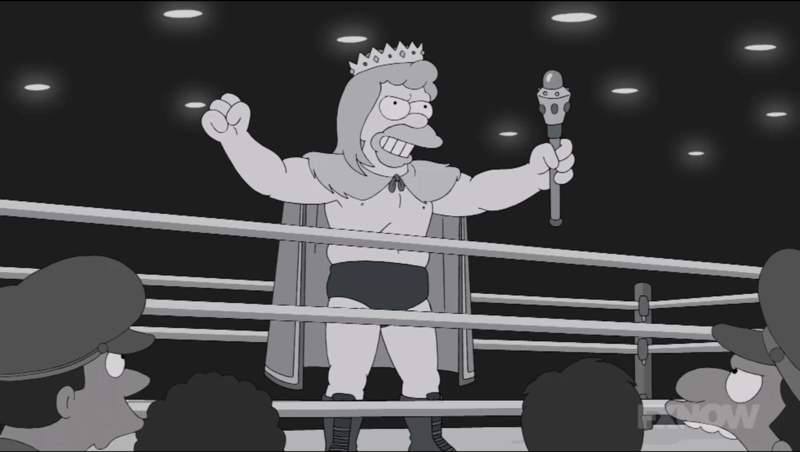 So to get a whole episode of The Simpsons dedicated to the entire world (both real and kayfabe) of pro wrestling, despite being past its prime, was still really cool. Homer finds himself binge-watching Storage Battles (48 episodes to be exact), which is one of those storage auction reality shows, and decides to take it up as his newest get rich quick scheme/hobby. He takes the family to their first storage auction and, in typical Homer fashion, gets in way over his head and overbids on a storage full of stuff that, at first glance, may or may not belong to an old lady. 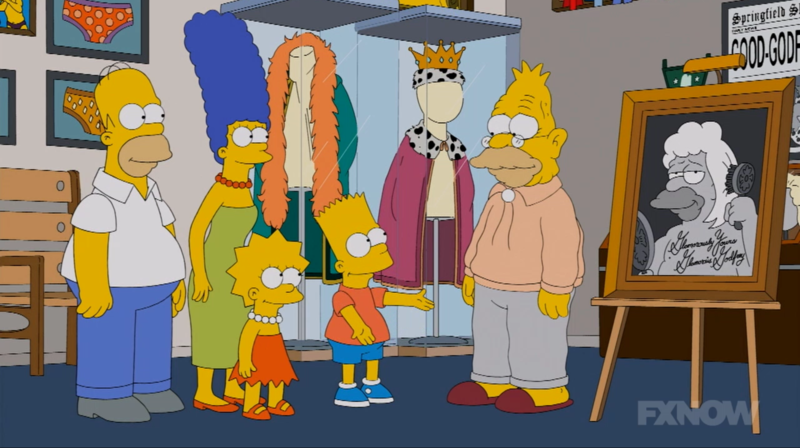 Among feathered boas, perfume spritzers, and hand mirrors, the Simpsons realize the boxes are marked with Grampa’s name: Abraham J. Simpson. In their continued search, they also come across old school wrestling magazines (40’s old school, not 80’s) with the most innuendo names, like Heave, Thrust, and Squat. With names like that, you can’t blame them for mistaking them for “beefcake mags,” and jumping to the conclusion that there’s only one certain demographic those magazines are aimed at, ey Bret Hart? Any true pro wrestling fan would’ve been able to put two and two together, but the Simpsons are casual fans, at best, and stick with the “Grampa Simpson is gay” assumption. Homer’s not taking it so well, but Marge tries to cheer him up with the fact that old gay men are adorable. Which, I guess, we can all thank the movie Beginners and Sir Ian McKellen for. The Simpsons family decide to help Grampa come out of the closet and accept who he is, but after a potential casual encounter gone awry at a nearby park, Mr. Burns strolls by and notices Grampa wearing his old wrestling wig. 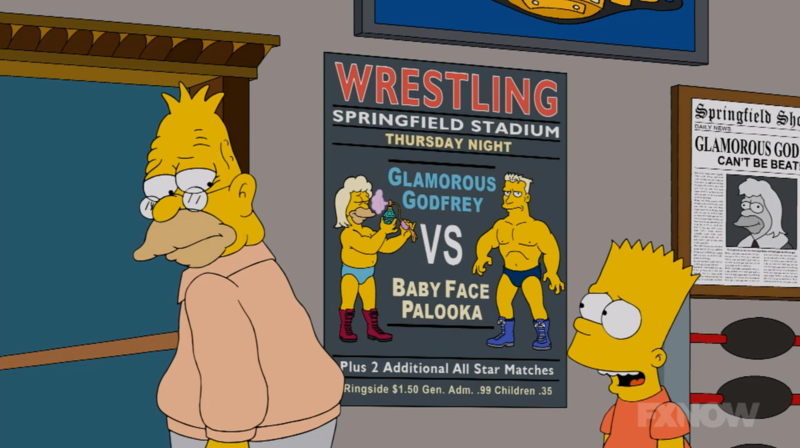 Burns instantly recognizes him as Glamorous Godfrey, the most famous wrestler in the world. And a straight up knock-off of Gorgeous Geroge. Grampa is then forced to come clean to his family. Mr. Burns then takes them to a secret wrestling room in his mansion dedicated to the golden age of Glamorous Godfrey. It’s basically the type of nerd cave every diehard wrestling fan wishes for, but without the action figures. Grampa breaks down his wrestling history, and even tosses in some of the jargon, like babyfaces, and heels. He also proclaims that he was the “king of the heels,” which is a nickname I hope some wrestler adopts someday. Despite cheating like crazy, Grampa goes on to explain how his vanity is what drew the real heat. But the non-kayfabe heat he was met with outside the ring was too much for him to handle, and he eventually hung up his boots. He didn’t say whether this was before or after his Flying Hellfish days. Mr. Burns exclaims that he was his biggest fan, as if the borderline-creepy wrestling room hadn’t tipped them off already, and asks to take Grampa out to dinner. Bart, who’s now in awe of his grandpa, also tags along for the free meal, and marks out even harder when Grampa finally goes into some of his old school battles with the likes of Olaf Johannsen, “The Fury of the Fjords,” and how he pulled the ol’ getting a beauty treatment during the middle of a match trick in order to get the jump on Johannsen. 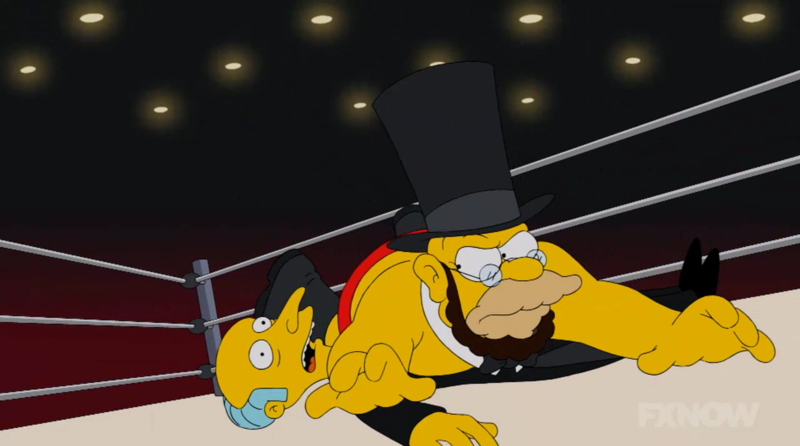 Burns begs Grampa to put the wing on once more and return to the ring, holding true to the notion that wrestling fans love seeing old wrestlers perform for nostalgia sake, no matter how out of shape or old they are. But Grampa is dead set against being hated again. Then, while not on par with the show’s more memorable songs, like, “Who Needs the Kwik-E-Mart?“, Burns breaks out a tune about how great it is being booed, dropping references to some well-known baddies, like Stalin, Eric Cartman, and Skeletor. All Burns really had to do was show Grampa how wrestling fans have evolved and are totally cool with the kayfabe of it all. And that bad guys move just as much merch as the good guys nowadays, but the song does the trick anyway, and Grampa agrees to return to the ring. The Simpsons family tag along to witness Grampa’s grand return and, still impressionable after 24 years, young Bart is overjoyed that his grumpy old Grampa was really a psycho wrestler all along. Meanwhile, Lisa looks through the program guide for this particular Golden Age of Wrestling event, which includes the names of such greats as Gorilla Joe, Gorilla Sam, Gorilla Pete, the Gorilla Twins, etc. But sadly, no Gorilla Monsoon reference. 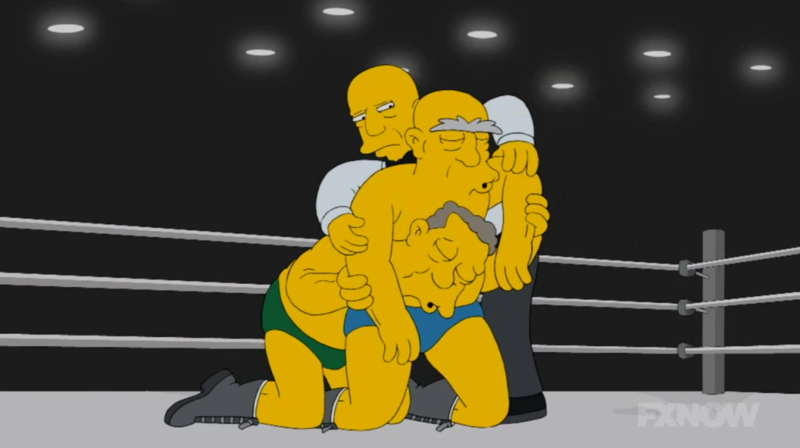 Once inside, Mr. Burns welcomes everyone to some “senior on senior action,” but instead of getting Nick Bockwinkel vs. Dory Funk Jr. from Slamboree ’93, we get two elderly grapplers falling asleep midway through, you guessed it, a rest hold. Even the referee knocks out. Before the main event, we do get to see a vendor guy in the stands hocking folding metal chairs, which was a nice touch. Finally, Grampa, as Glamorous Godfrey, makes his glorious entrance via a carriage, replete with fancy horses and assistants, as he readies himself to face off against the aptly named, Babyface Palooka. Like his very own Darth Sidious, Mr. Burns eggs on Grampa to draw that cheap heat and Grampa complies, adopting his snobbish accent, getting a portrait painted of him, then using said portrait to bash Babyface Palooka over the dome with, without even waiting for the artist to finish. He then finally throws in an actual wrestling move in the form of an eblow drop to finally put Palooka away. Marge, as only Marge can do, voices her disapproval for Grampa’s cheating ways instead of relying on his God-given wrestling skills. And it’s clear that Grampa has kept true to his carny roots and refrained from letting in his family on the fixed nature of professional wrestling. Bart takes this all in with a mixture of glee and malcontent. Like the most successful athletes and rappers, and now, even presidents, Bart adopts the mouthy, bad boy nature of professional wrestling, and incorporates it into his little league game. The pompous showboating draws the intended reaction Bart hopes for, but Homer and Marge catch all the heat from the rest of the parents. Bart carries on his newfound attitude within the classroom, and an angry Homer storms into Burns’ office to confront his old man. Grampa brushes it off and argues that the family can use another winner. Homer checks him by reminding him that he’s cheating in a fake sport. Marking this one of the few episodes where Homer isn’t as dumb as we think he is, and also disproving that one headline from the Springfield Shopper wrong. This sudden revelation throws poor old Monty Burns for a loop as he ponders out loud, “If professional wrestling were fake, that would make every fan in the history of the sport a complete and utter moron.” Mind you, he says this while staring directly at the camera. At you, at me, at us wrestling fans, because there’s no more tired joke in the history of professional wrestling fandom than this one. Well, that one and the whole gay thing, but that one was pretty much the basis of the first act. Anyway, Burns likes what he sees in Bart’s antics and convinces Grampa to make Bart his new tag team partner, despite Bart having no professional training, and also being an eight year old child. Then again, that never stopped nine-year-old Haruka from getting inside the squared circle. Sadly, The Simpsons don’t go with the obvious inside gag of naming Bart, Bodacious Bart, and instead settle for the just as alliterated, Beautiful Bart. While Grampa goes over the match with Bart in the dressing room, Marge walks in to once again voice her worries about Bart taking this “bad guy” role a little too far to the point where he might start living the gimmick. Of course, she’s right, and Grampa notices this later when Bart shoots a snot rocket at a young fan’s autograph book while making their way to the ring. 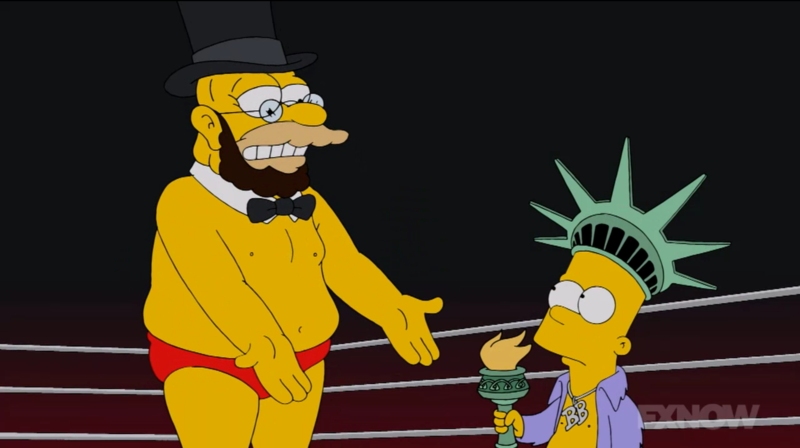 The Simpsons’ opponents are a true staple of the world of professional wrestling, an All-American team that includes a little wrestler, who are collectively known as Captain Flag and Half-Mast. Kudos, Simpsons. Kudos. As soon “The First Family of Foul Play” make their way to the ring, Bart wastes no time working the crowd and proving that you can’t be successful in wrestling if you don’t have a handle on who your character is supposed to be. A major plot point that is also relevant in the new Netflix show, GLOW, and something the WWE keeps failing to develop with most of their new wrestlers’ characters. Grampa grabs the mic and pulls a One Man Gang/Akeem switch, declaring Glamorous Godfrey dead, and in his place, Honest Abe, which he emphasizes with a slapped-on beard and stove pipe hat. Before Bart can even question him, Grampa transforms Bart into Laddie Liberty. Burns berates them and goes so far as to call Bart a “morbidly obese little half-wit,” proving no heel can match Mr. Burns when it comes to talking trash. Grampa responds by finally employing some of his God-given wrestling skills. He gives Burns the tried and true airplane spin, then follows it up with moves that he most definitely did not use during the Golden Age of Wrestling, like a power bomb, and finally, a splash off the top rope. He then lets Bart finish him off with an elbow smash, followed by the three count. And for the first time in his wrestling career, Grampa Simpson hears the overwhelming sound of cheers. Something WWE is still trying to accomplish with Roman Reigns to this day.